All those travelling to this destination will get to know the southernmost city of the world and the sea fauna in Madryn, in the wildest and most natural environment. The trip begins with transportation to the domestic airport in Buenos Aires to take the flight to Trelew. Our travellers will be welcomed at the airport and transported to the Pedral Lodge, where they will spend three nights, with all meals included. The natural viewpoint in Pedral Lodge gives all visitors a stunning and exclusive panorama of the whales entering the bay, just a few meters from the main building. Wide rocky beaches amaze tourists with their variety of inhabitants: sea lions, sea elephants and countless species of birds. The Patagonian steppes also offer an incredible fauna, such as maras, martinetas, guanacos, ñandúes,piches and the typical sheep. Those who wish to enjoy the amazing sight offered by the sea fauna of the region, the Pedral Lodge is the ideal place as it offers unique chances for watching the whales from the shore of the Lodge, on foot or from the hills on horse. You can also watch the penguin and sea lions colonies. Those who like adventure will be able to go for a trekking or mountain biking tour, or just a walk along the beach, horseback riding down the hills and cliffs, or sandboard in the dunes. The ocean also offers boat and kayak trips, snorkelling, water skiing and offshore fishing. These are some of the activities the sea offers in this area. On the fourth day, you will be transported to Trelew to take the flight to Ushuaia. Reception at the airport and transportation for a 3-night accommodation in Los Cauquenes Hotel, including breakfast. Located in a privileged spot on the banks of the Beagle Channel, with an amazing view of the snow-peaked Andean Cordillera, Los Cauquenes Hotel is surrounded by a unique landscape. With an architecture typical of the region, covered by lenga timber and stones of the region and nestled in one of the most exotic places in the world, it is regarded as a unique and exclusive hotel. The rooms inside are an invitation to enjoy the hotel all year round. 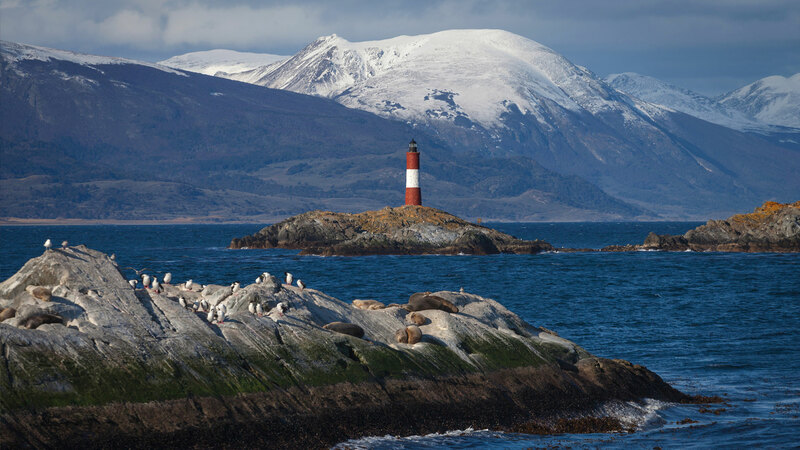 From the hotel, the visitors go on the following excursions: Tierra del Fuego National Park, the End-of-the-world train, Isla de los Lobos and Isla de los Pájaros, home to a wide range of sea animals and birds. Day 1: Transportation to the domestic airport in Buenos Aires to take the flight to Trelew, reception at the airport and private transportation to Pedral Lodge. 3-night accommodation, including all meals and drinks. Arrival and visit to the natural surroundings where sea elephants live (3 hours), depending on the arrival time. Return to the Lodge and dinner. Day 2: Breakfast. 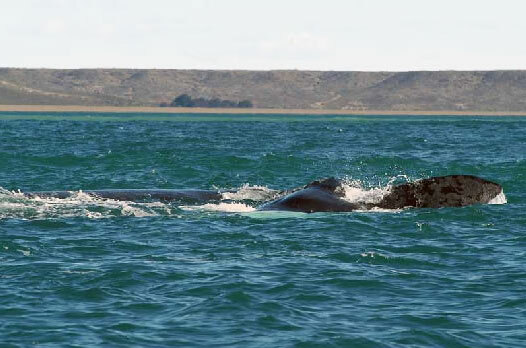 7-hour excursion to Puerto Piramides to watch the whales from boats. Sailing 2 miles offshore and watching these huge marine mammals. The boat motors will be off to enjoy the amazing show nature offers. When returning, visiting Isla de los Pajaros, Riacho and El Doradillo, to watch the whales and their calves swimming close to the shore. Return to the Lodge and dinner. Day 3: Breakfast. Day at leisure at the Lodge: fishing, trekking or mountain biking. Lunch and dinner at the Lodge. Day 4: Breakfast. Transportation to the airport in Trelew to take the flight to Ushuaia. Reception at the airport and transport to Los Cauquenes Hotel. 3-night accommodation, half board. Day 5: Breakfast. Excursion to Tierra del Fuego National Park, to enjoy the flora and perfume of the forest, and breathing fresh air from the sea. Duration: 4 hours. Afternoon at leisure to go to the hotel SPA or enjoy the sights from the hotel. Dinner at the hotel. Day 6: Breakfast. Excursion to the End-of-the-World Train, which used to transfer the inmates of Ushuaia Prison to labor camps at the beginning of the last century, enabling the tourists to learn part of the history of the region. 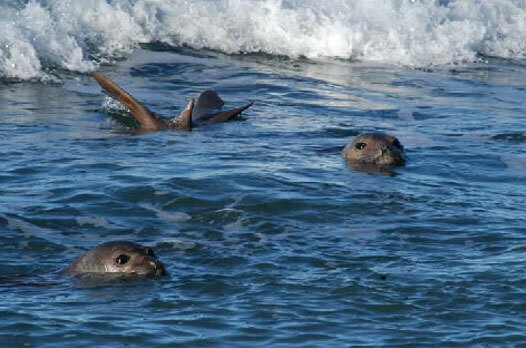 In the afternoon, visit to Isla de los Lobos, to watch sea lions from modern and comfortable boats. Dinner at the hotel. Day 7: Breakfast. Transportation to the airport to take the flight back to Buenos Aires. Reception and transfer to the selected hotel. Rates include: Transfers in all the places -Flights Buenos Aires/Trelew/Ushuaia/Buenos Aires-3 nights accomodation in El Pedral lodge , with all inclusive , meals and beverages , visit to see the sea elephants-Boat excursion to see the wales-fishing/biking and trekking-3 nights accomodation in Ushuaia Los Cauquenes Hotel , breakfast included-Excursion to the Parque Nacional Tierra del Fuego-Excursion to the Tren del Fin del Mundo and Isla de Lobos.